We all k now that life has ups and downs. It goes almost without saying. “I had a good day.” “…bad day.” “….a terrible, horrible, no good, very bad day.” (Apologies to Judith Viorst.) But for some of us, life is more of an extreme thrill ride. It is far from a little kiddie roller coaster. Bandler and Grinder were, so far as I can tell, responsible for moving the idea of the sense-based learning styles into the mainstream of educational conversation back in the eighties. People were primarily visual,auditory, or kinesthetic learners, they claimed. In their inner map people represent the same things differently. It is how they organize their memories. That is the heart of the concept, although volumes have been written about it. Some people are very balanced. Some people sense life with one system but represent it mentally in another. So a visual artist might be a visual-kinesthetic. A musician might be an auditory-kinesthetic. The visual style of learning/thinking is the most common. Our visual culture has tended to make this more so, in my humble opinion. People can change pictures mentally very quickly. Extreme visual thinkers can be a joy or a terror to follow. Robin Williams and Jonathan Winters (April 1964 – Tonight Show) appear (get it, appear?) to be visual thinkers. The pictures change quickly in their head and their comedy changes directions rapidly. The kinesthetic style is the least common. Please note that we all have elements of all three styles, but most of us tend to work more with one. The kinesthetic person is concerned most with the sensation of touch and/or emotions. These days this seems to be called “feels.” The kinesthetic eye cue is downward and to one side. When people are deeply sad you can see them do this, no matter what their learning/thinking style. The two kinds of feelings, emotions and touch, are intertwined. This is me. This my world. Most creative artistic people have a strong kinesthetic component to their inner makeup. Some are far, far over in to the realm of feelings. Many of these are percussionists. (I bet you suspected something like that.) Kinesthetic learners often like to have their hands busy. (When I went to church as a child I worried the church bulletin with my hands until their was not much left of it when church was over. I am still pretty hard on programs.) When they go to the beach, they see the sun on the sand, they hear the wind, the waves, and the seagulls, but they remember it by pinning it all to the feeling of the waves crashing against them, their feet sinking into the sand, the warmth of the sun (like the Beach Boys), and their emotional state. We can all relate to those things, but the kinesthetic person primarily represents life this way. Their memories are anchored mostly by emotions and feelings. Oh, by the way, athletes are frequently kinesthetic thinkers and learners. This blog post is for people who are kinesthetes. (I think I made up that word.) It is also for people who have kinethetes as coworkers, family members, and, yes, as children. It has to do with lessons learned over time that, if understood, can help kinesthetes appreciate the unique lives they live. The first thing to know is this: Mental pictures can change quickly. Mental sounds change more slowly. But feelings can persist for a long time. As in, persist all day. More than is helpful, sometimes. A kinesthete can get angry or upset about something at breakfast an still be feeling it at lunch. They sometimes feel it long after they have forgotten where the feeling started. (Whenever I present this idea to a group I see heads begin to nod here.) Knowing this helps one to work their way out of it. But even after you understand the concept you will find that feelings tend to persist. Over time the intentional kinesthete can become much more adepts at surfing on the emotional waves instead of getting swept away. There is another side of the coin, however. When life feels awesome, it is really awesome. The best. The kinesthete walks through the valley of the shadow of death, but also climbs the mountain. Perhaps King David, musician, poet, and warrior, was a kinesthete. (His feelings did tend to get him into trouble at times.) Psalm 23 really does seem to describe the journey up and down the mountain and through the valley. Some people literally get stuck in a feeling for many years. Being stuck sometimes needs professional counseling/therapy to get back into the rhythm of life. I have at times suggested that a person seek a therapist. Sometimes people actually take the advice. Once again, these things are true, to some degree, for everyone. They are just more extreme for the kinesthete. Kinesthetes sometimes get into trouble trying to “manage” their emotions instead of experiencing them. Emotional management or suppression is a poor substitute for learning appropriate means of expression. Yet some people instinctively know that they are “different” and seek something to make themselves fit in. Substance abuse can be a big problem. Tobacco/nicotine is often the drug of choice for kinesthetes. Cigarettes are amazing, really. I have never smoked, but as a musician I find that have musician friends who do and I have asked them about this. As it turns out, a cigarette can really calm a person down when they are stressed and too wired. On the other hand, when a smoker is depressed and down a cigarette makes a great pick-me-up. I have read that scientists are actually studying how nicotine can be both an upper and a downer . It is easy to see why it can be so addictive. It is sort of a one-size-fits-all for mood problems. It is understandable that a kinesthete would find this attractive. Some studies have shown that smokers actually overestimate the amount of life they lose by smoking yet continue to smoke. It is a high price to pay for self-medication. Cigarettes are indeed slow death. They don’t kill you right away. But if you are a kinesthete they actually rob you. They take away the top of the mountain. They also, at a high price, take away the valley. Other abused substances similarly interfere with the full experience of life. If you are a kinesthetic you are meant to experience the mountain and the valley. And if you are an artist/performer/composer/writer (and and and) you are meant to experience all of this and then, through your art, interpret and share it with the the world. There are many names for this up and down cycle: The Yin and the Yang, both sides of the coin , the circle of life. Regardless of how we fit on the kinesthetic scale we are made to learn and grow from the good and bad things we experience. Sometimes people are only able to learn the deeper lessons from dealing with adversity. The mountaintop and the valley and the road in between are all part of life. 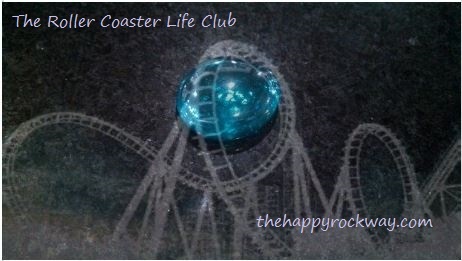 If you are a member of the roller coaster life club your gift is your curse is your gift. Deal with it. Press on. Learn to live by savoring the way you were made. Sometimes the best time of life is not the top of the mountain, it is the climb up out of the valley. When have been knocked down and have gotten back up there is often lots of energy available if you look for it. In truth, the top of the mountain is much more special because of surviving the valley. The life of the artistic, creative kinesthetic learning person not simple or easy, but it is a rich life full of the very things that make us human. It is a great gift from the One who made us once it is understood and appreciated. And those who choose to use this gift to create works of art that help interpret human emotions to others can hopefully bless others. A lot of what I have come to call the Happy Rock Way concerns learning how to live The Roller Coaster Life and make the most of it. It applies whether you are on a smaller roller coaster or on the big scary ride. All are invited to hang on and make the most of life. Stay tuned.